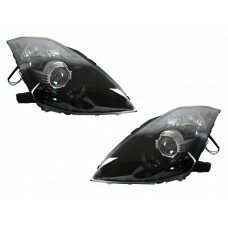 Unique JDM Style Black Housing with Projector Lenses with Bi-Xenon Shutter built in -- Excellent for increased visibility and output! D2S Sized bulbs used for Low/High Beam (Bulbs and Ballasts are not included, please reuse existing setup) - For 2003-2005 years, please be sure to GROUND your ballast and re-wiring is needed. The original stock ballasts must be mounted securely and correctly to AVOID moisture from building up inside the lenses. Condensation usually occurs due to inaccurate installation, NOT because of the seal is broken. The LAST photo shows the OEM gaskets (They are not included) and the OEM Part # is 26033M. Made by ISO 2001 Certified company, DEPO.--Quality is Guaranteed! Direct Replacement - Not universal type lights, no modification needed - Easy Installation. Please check the PHOTOS and read the DESCRIPTION prior to buy, what you see is what you will get.